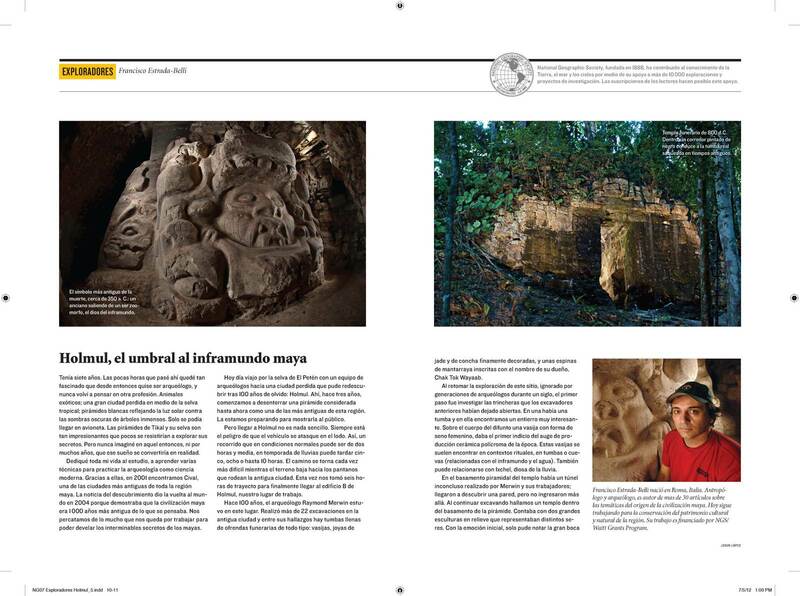 From this month’s issue of National Geographic Magazine en espanol, in the “exploradores” section: Estrada-Belli talks about his dream of becoming a maya archaeologist. 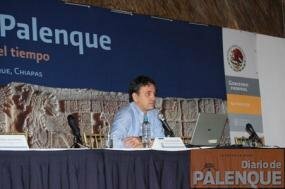 The fifth annual Maya convention in Antigua, Guatemala will showcase the major archaeological projects in the country. On June 15, Dr. Estrada Belli will present the sites of Holmul and Cival. 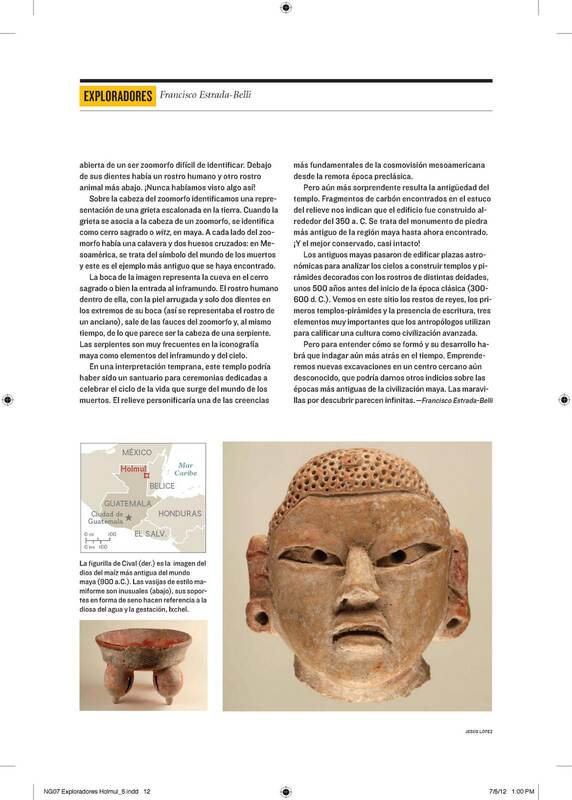 On June 17, on the origins of Maya calendar and cosmovision at Cival. New York, May 16, 2012. On March 26, 2012 MAI and PACUNAM signed an agreement to join efforts in gathering support and executing projects for the protection of wildlife and cultural resources in the Maya Biosphere Reserve of Guatemala. PACUNAM (Fundacion Patrimonio Cultural y Natural Maya –www.pacunam.org) is the most prominent Guatemalan NGO working to foster the sustainable development of archaeological sites and their unique tropical forest in northern Guatemala for the benefit of local communities. Pacunam’s recent project have been focused on the Carmelita community and Mirador region of northern Peten. With the new agreement, both MAI and Pacunam, two organization with common vision and goals, will expand their focus to inlcude new sites and increase fundraising opportunities in Guatemala and abroad. This partnership will undoutedtly result in many benefits for the protection of Guatemalan cultural and natural resources and for improving the quality of life of local communities. On January 24, 2012 the National Geographic Society named MAI’s Francisco Estrada-Belli among its Explorers. Among National Geographic Explorers also figure oceanographer Robert Ballard, discoverer of the Titanic, primatologist Jane Googall, paleoanthropologist Lee Burger, author Jared Damond (Guns, Germs and Steel), egyptian archaeologist Zahi Hawass and many other distinguished scholars in the fields of conservation, biology and zoology. Estrada-Belli is one among 13 archaeology explorers. He is the only Mayanist and the only Guatemalan in the NatGeo list. El Inicio de la cultura Maya no fue debido a influencia Olmeca dijo Estrada-Belli en la VII Mesa Redonda de Palenque este lunes pasado en la cual se reunieron 25 de los mas distinguidos arqueologos y otros investigadores de esta cultura. The beginnings of Maya culture were not due to Olmec influence said Estrada-Belli on Monday at the VII Mesa Redonda de Palenque attended by 25 among the most distinguished scholars in archaeology and related fields. Read more from the Diario de Palenque. The tussle of the toucans has ended with a decision to shake wings and work together. Battle Creek-based Kellogg Co. is satisfied that its trademarked Toucan Sam character isn’t in danger, and the San Ramon, Calif.-based Maya Archaeology Initiative can keep using its own toucan logo. What’s more, Kellogg is making a $100,000 contribution to cover a major part of the cost of building the MAI’s long-planned Maya cultural center in Petén, a district in Guatemala, said MAI spokesperson Sam Haswell.